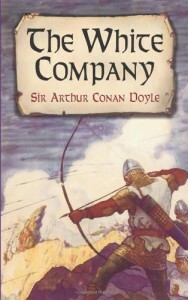 _The White Company_ by Sir Arthur Conan Doyle is equal parts boy’s own adventure and historical fiction of the Hundred Years’ War. It reminded me very much of the spirit of Sir Walter Scott’s Ivanhoe, though it’s been so long since I read the latter story I wouldn’t want to draw too many specific comparisons. The story is that of a young aristocrat, Alleyne Edricson, who leaves the safe confines of the abbey where he was raised in order to see the world for a year before deciding on the path his life is to follow. From the first Doyle fills his tale with action that is tempered with descriptive passages detailing the varied aspects of medieval life of England and France in the fourteenth century. One gets a detailed sense of a world in which the habitations of man were widely interspersed amongst the ever present wilderness with areas of cultivation spread between. The story Doyle tells straddles a strange line, for while there are parts that read like an idyllic paen to the simpler and purer days of yore, he does not shy away from presenting hard truths regarding the savagery, poverty, and tyranny that were also pervasive at the time. One is often left wondering whether Doyle wanted to praise or berate the era, to simplify it or acknowledge its complexities, but perhaps he simply felt that, like any other age, there was equal measure of both praise and blame to be given to it. Alleyne’s relative innocence and inexperience with the world outside of abbey walls allows him to be an excellent stand-in for the reader, as he experiences for the first time the realities of the wider medieval world. As though immersed in a kind of Canterbury Tales Alleyne meets pardoners, friars, palmers, hucksters, knights, peasants, franklins and soldiers allowing the reader to experience a veritable cross-section of medieval society in all of its varied glory. Sometimes this can come across as a bit too pat, as Doyle manages to have Alleyne cross paths with nearly every segment of medieval society on his journeys along the highways and byways of England and France. The characters of Alleyne, with his wide-eyed innocence, and Sir Nigel Loring, with his almost simplistically quixotic belief in the tenets of chivalry, give Doyle the chance to indulge in elements of chivalric romance, while the more hard-bitten archer Samkin Aylward and his less idealistic comrades in the White Company allow for a more pragmatic look at medieval warfare to be examined. Still, for all of the historical detail that Conan Doyle may have laden his story with, it definitely seems to come down on the side of idealistic chivalry; for despite its acknowledgment of the unending warfare with the goal of plunder that turned half of France into a wasted no-man’s land, sly allusions to the inherent naiveté of many of the ideals of chivalry through the literally and figuratively myopic Sir Nigel, and various references to the downtrodden peasantry (including a scene in which a tyrannical seigneur’s castle is attacked and destroyed by a starving peasant mob) the novel still often reads like the Middle Ages as produced by Metro-Goldwyn-Mayer. It was still an enjoyable read and further goes to show me Conan Doyle’s range as a writer.